This room was designed as the sovereign’s study. The iconographic intention, therefore, was to celebrate his cultural qualities. 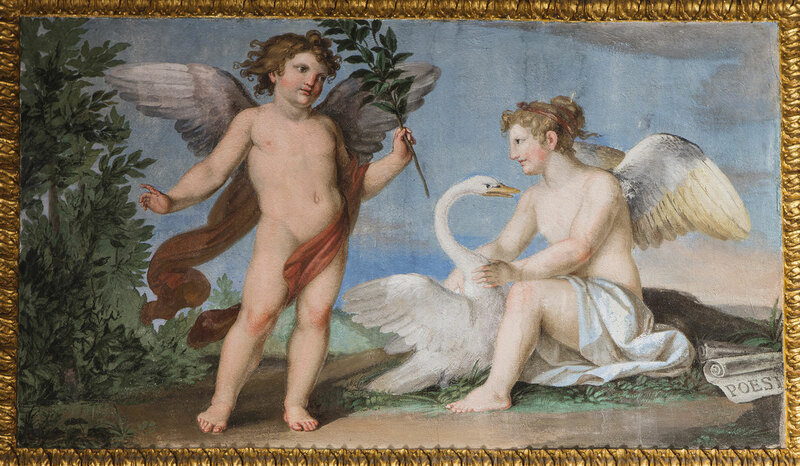 On the ceiling there are frescoes painted in 1818 by Domenico del Frate, disciple of Bernardino Nocchi, narrating the Stories of Apollo. 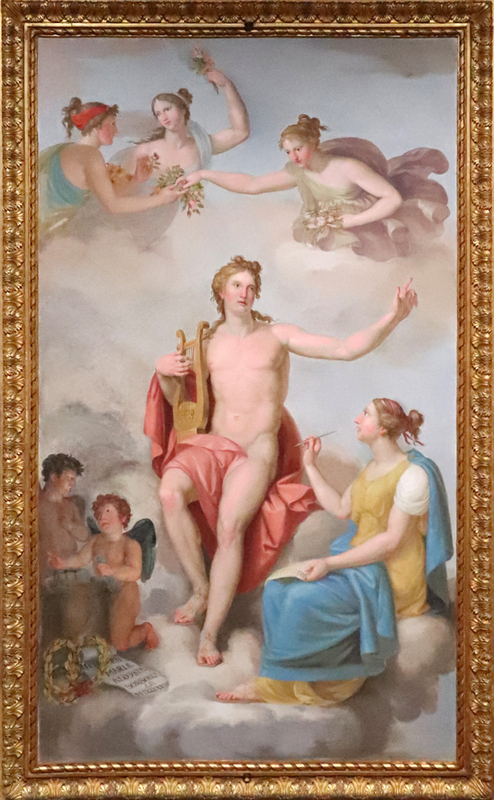 In the centre, the mythological story of “Apollo teaching History”. 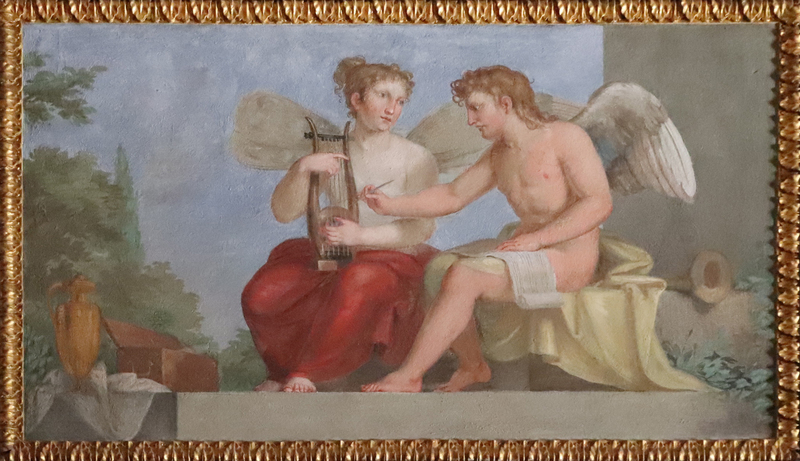 On the left two cupids playing with volumina – rolls of parchment – contained in a case, are represented. Above, three nymphs scatter multi-coloured flowers. In the scroll the words “Mugnificentia Maria Luisa Borbonia”, A.D. 1818, are visible, while the monochrome laterals are faux bas-reliefs showing the “Birth of Apollo”, “Apollo in his day Chariot”, “The Punishment of Marsyas” and “Parnassus”. The celebration of Apollo as god of arts is continued on the four doors. 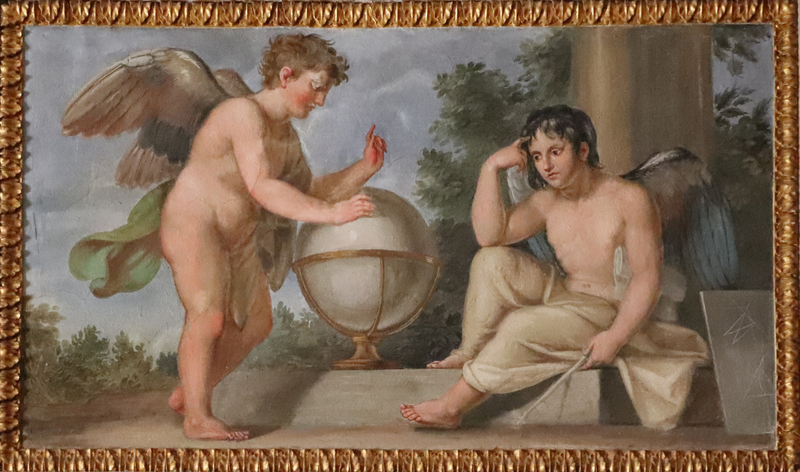 On the walls above the doors Luigi Catani’s decorations depict Astronomy, Poetry, Painting and Music, accompanied by a cupid helping them in their work. The doors in walnut wood are delicately decorated with bronze reliefs referring once again to the motif of Victory and Fame. The fireplace designed by Lorenzo Nottolini is tiled with blue and white majolica with rosettes and amphorae. The sun in relief on the terracotta tile at the bottom is another symbol of the god Apollo. The bronze bas-relief on the architrave includes some scenes from the Trajan Column in Rome. Above the cabinet there is a “Buonvisi family portrait” attributed to the Flemish painter Frans Pourbus. There is also a scene representing probably a penitent San Girolamo from an unknown artist.